Polyester laminating resin. This is the same resin used in the automobile and boat industry. (Available in gallons and quarts). 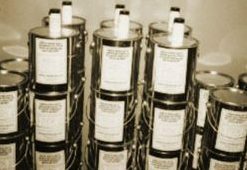 Methyl Ethyl Ketone Peroxide (MEKP) is the standard hardener (catalyst). 2 oz. bottle enough to harden one gallon. Virden Perma-Bilt Co. has a complete line of fiberglassing products. Heavy-duty cloth, cross-sectional matt and fillers. Also a complete line of polyester laminating resins, catalyst, and color pigments that can be mixed in the resin eliminating paint jobs, plus acetone solvent for cleanup. Virden’s polyurethane boat paint is unequaled for marine applications. 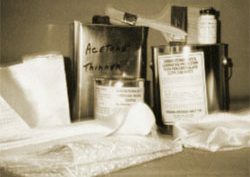 We also offer a complete line of epoxy casting resins. These epoxy resins have less than 1% shrinkage (where polyester resin has 8% to 10% shrinkage). The epoxy tensile strength almost equals that of nylon. 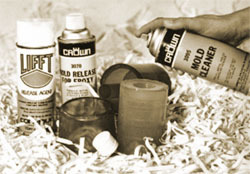 Also a complete line of mold release agent for epoxy, urethane, a polyester is available. Some ranchers and farmers still prefer to repair stock tanks with fiberglass resin and cloth material. In many cases where you have very large holes in the walls of your tanks, the combination of our epoxy paste and fiberglass cloth material is unbeatable! You can repair a hole the size of a football if needed. Call 806-352-2761 for more information about any of our laminating resin and fiberglass products.